Exhausted, cynical, and confused, Anna is always there to report for duty. She's part of a clandestine government team that defends the nation against supernatural terrorism -- a job that understandably leaves her life in shambles and drives her to drink a little more than she should. Toss in a fear of intimacy with a desire to have friends and lovers like a normal person and, well, Anna is a troubled soul wrapped in a special agent with arcane, magical powers. Waking up hungover at five-thirty in the morning with a zombie-infested apartment building in the heart of DC to deal with, she knows she's got the makings of the worst morning possible. Her team is its own challenge. A battle-scarred Nigerian shaman, a bookish shape-shifter, an inept summoner, and a brilliant but cantankerous wizard round it all out. Her partner, an immortal and cursed Paladin, is the only person she knows more jaded than herself. Getting them all to work together is never easy, with Anna often caught in the cross fire. Their target, Ethan Morgan, is one pissed off necromancer. His brother was KIA by his own government, the victim of an experimental magical weapon they decided to test on the battlefield. Now bent on revenge and sponsored by one of hell's most powerful demons, Ethan has a plan of his own to make us all pay. Anna and her team are fighting against the wake of destruction, but Ethan is always one step ahead. With the number of bodies he leaves and reanimates growing exponentially, Anna's wondering if they'll stop him before he engulfs everyone in an undead horde. Proving once again that revenge is best served cold, usually with reanimated corpses, J. Hamlet's genre bender is the kind of seat-of-your-pants thriller that changes your view of what is possible in literature. This jaunt into a dark reflection of our world of the blends dark fantasy and surreal horror with a spy thriller to create an extraordinary new genre all its own, riding the rails at breakneck speed as heaven and hell throw out every villainous creature they can. 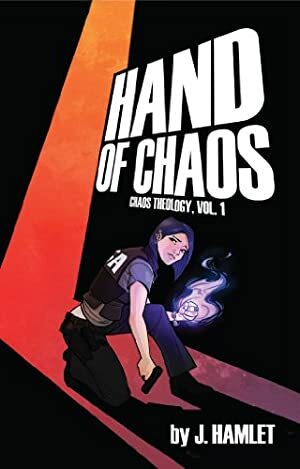 Hand of Chaos is a no-holds-barred action fest full of imaginative horrors and inspired satire. Log In to track J. Hamlet on eReaderIQ. to be notified each time the price drops on any book by J. Hamlet. to stop tracking J. Hamlet. We started tracking this book on July 16, 2018. The price of this book has changed 14 times in the past 280 days. This book has been $2.99 7 times since we started tracking it.